on the stray sovereign of an Irish summer’s day. a man rises, seal­-like, in his caul of silt, to wave. a black dog jumps, again and again, into the water. Jessica Traynor's first collection Liffey Swim (Dedalus Press) was nominated for the 2015 Strong/Shine Award. 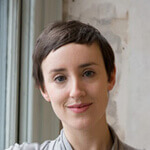 She was a 2014 recipient of the Ireland Chair of Poetry Bursary and 2013 Hennessy New Writer of the Year. In 2016, she was commissioned by the Irish Writers Centre and Ireland 2016 to be a part of 'A Poet's Rising'. Poems have recently appeared in Poetry Ireland Review's 'Rising Generation' issue, Agenda, the Cafe Review and have been broadcast on Sunday Miscellany. Any day in axis Ballymun is filled with potential. That's what makes working in the arts and in a community as vibrant as Ballymun so special. For me arts, culture and creativity is about people, about ideas, about synergies and most importantly about listening - really listening. axis is all about this, about creating a space where people can be entertained, try out new ideas in a safe environment, meet, discuss, and come to the heart of the northside to make magic. I have had the pleasure of working in Ballymun, with a great staff, community, artists, and a multitude of stakeholders for nearly 12 years now, and I can safely say that no two days in all that time has ever been the same.